"Knowledge of financial and fiscal workings is one of my weaknesses but, I find it amazing that the whole country and it's 'qualified' representatives talk of generating revenues only through either increasing taxes or cutting public services, with no thought for a third option oriented in creating, building and growing products to export - it doesn't even enter our minds! 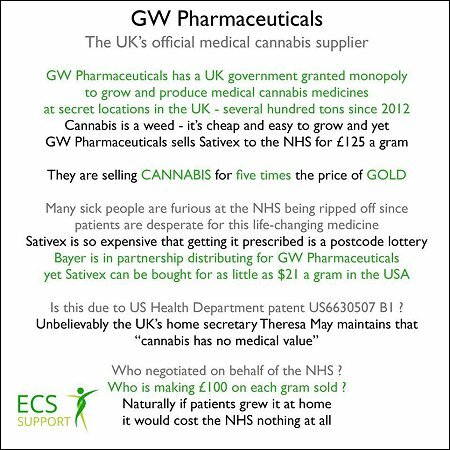 We have a crippled farming industry that would love to grow hemp and that in doing so, could also end global deforestation but due to sleep-walking UK voters continually rejecting true democracy, this will never happen. I can't believe how easily my country turns on itself just to repay debts that successive governments alone have built-up, so as to implement policies that no one ever voted for [the UK votes for parties and their manifestos and NOT for individual policies]. If employees of a commercial entity did the same, they would be fired for gross misconduct and/or negligence but in the UK, we don't even want for MPs to repay their own debts and without question, we willingly repay them while voting to punish the poor and the vulnerable instead! It is NOT public debt and the DWP was NOT created so as to save money for the government. The DWP and its welfare benefits system is the people's safety net - not theirs and, I can't believe that the UK people agreed to bail-out criminal banks instead of letting them fail and demanding the establishment of a state-ran national bank to collect their customers as they fall." Just choosing to reform to true and direct democracy will automatically save a minimum of £135 M every five years by ending general elections and their off-line voting forums. By closing the unelected House of Lords, a further £3,120,000 a year will be saved just on the food and drinks bill alone, with even more being saved in expenses. Despite the AV Referendum in 2011 costing approx. £250 M and, despite the Scottish Referendum in 2014 costing approx. £13 M, UK voters who say that they want a stronger economy are more than happy for their freely-elected partisans to blow approx. £300 M on the EU Referendum - when an on-line referendum would only cost approx. 5% of the cost of an off-line referendum! While those we freely choose to elect readily fund the annual Corporate Welfare bill of £85 BN [successful but greedy multi-billion pound corporates are still subsidised by tax payers], the NHS is close to crashing for the sake of just £8 BN. 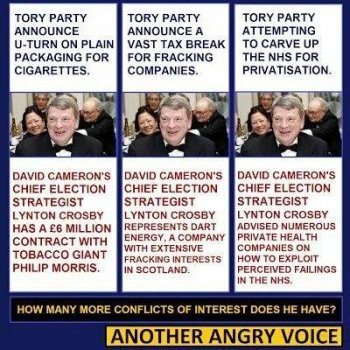 After May 2015 and in a true democracy, the people could vote to use a subsidy from the Corporate Welfare budget to fix the NHS but, if they instead choose to leave all decisions to a corrupt minority, the results will ultimately be of their own choosing and not due to the decisions of MPs. The PA's solution for rescuing the British steel industry in 2015 would have been to nationalise what was left of the industry, supply the domestic UK market only [exporting British steel would be too uncompetitive], and to save money by not importing steel from China [for example] or from anywhere. However, 'qualified' and freely-elected MPs and their advisers missed this and because the UK rejected true democracy, the people do NOT have the option of even debating this [or ANY] potential solution - never mind have the option to vote it into law. It is because of this that we place the blame for the collapse of this industry on both the government and its electorate. Incidentally, if you're concerned about the UK trading with China on the grounds of China's poor human rights record, the UK electorate freely-voted to empower a government that has now become the first country in Europe to ever be invesigated by the UN for DOMESTIC human rights abuses! • Haringey Council used £900,000 of tax payer's cash to fund child abuse cover-up! 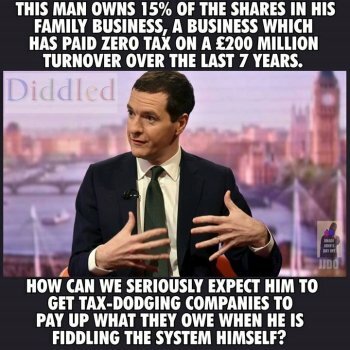 • Under Osborne's new tax regime, cheating corps will pay a 'MASSIVE' £300 avoidance fine! • BBC Silent: Cameron and IDS spent £8.5 M on one TV advert! • BBC Silent: Theresa May cuts police budgets - then awards 999 call business to HER HUSBAND! The cost of conducting the 2010 general election was approx. £84 M. A further £28 M was spent distributing candidates’ environmentally-inconsiderate mail shots so regardless of the words MPs use, their actions confirm that they don't care for the environment [which we all already know] or the economy [when a Prime Minister chooses a cousin who is a historian to run an economy, the primary concern here is obviously cronyism and not economics]. • Budgets were determined by Cameron's personal ego! Instead of social welfare budgets benefiting from an additional £135 M over 5 years, MPs slash them to the point where children who are known by social services to be suffering from sexual abuse in their own homes are abandoned. Incidentally, it is often said that the best way to assess the nature of a culture is by primarily considering how that culture treats its vulnerable and if this is an accurate measure [as we believe], then 'Great' Britain is no more than an empty title because it certainly no longer exists as a culture. Even within a 'representative' democracy, if voting in general elections was administered via the web and phone, we estimate that the cost of running a general election would be closer to approx. £10 M.
However, MPs are aware of this but they instead choose to spend 13 times more than they need to [of your money - not theirs] maintaining an out-dated, mismanaged and highly inconvenient voting procedure simply because on-line voting for representatives would point the way to on-line voting for policies [true and direct democracy] and, when MPs vote in accordance with their party leader or with their own opinion instead of voting only in accordance with their constituents' opinions, it is obvious that MPs consciously aim to serve themselves and, not just above the country, but at the expense of the country [including those who empower them]. Maintaining the UK's 'representative' democracy will cost over £3 BN in 2015 alone! It doesn't take a mathematician to see that this isn't value for money. Freely-elected so-called 'qualified' politicians will destroy this world before ever relinquishing their parliaments, senates, assemblies and powers to the people who actually own them and ultimately, of submitting to true and direct democracy. While MPs act from a position of hypocrisy, the people can vote to act from a position of truth because for the first time in its history, the UK will be choosing between true democracy and representative rule [there is no such thing as 'representative democracy' - it is a dichotomy] in the 2015 general election. 1. Empower 'representative' democracy and endure austerity so as to bail-out criminal banks ran by party donors and shadow governments. 2. Reform to true and direct democracy, deny shadow governments any influence, let their criminal banks fail and prosper. The pattern emerging since 2010 demonstrates that true prosperity can only be achieved via a combination of true and direct democracy [to any substantial degree] and letting criminal banks fail. For example; Greece [along with most of the EU] voted for option 1 while Iceland and Norway both voted for option 2. Iceland and Norway are the clear winners and, while David Cameron maintains the lie that the UK is Europe's strongest economy due to austerity, the people of Iceland who voted against austerity and to jail their criminal bankers are very aware of the truth. Incidentally, it is extremely easy for politicians to be "hard" when they never endure the results of their harsh social policies! The Greek people chose to empower 'representatives' who since 2003, spent more than £150 BN on arms [more than the bail-out], whilst failing to collect taxes from the rich. Since austerity was imposed in Greece, the Greeks could have chosen to reform to direct democracy but instead, they chose to protest. Spain, Italy and others will follow and unless the UK chooses to reform to direct democracy, UK society could also break-down under the pressure of unnecessary austerity measures. It is our firm belief that by betraying the principals of true and direct democracy, the Greek people have betrayed themselves. Further to this, the Greek government's failure to demand that Germany repatriates £65 BN in stolen WW2 artefacts before attempting to renegotiate with the IMF and ECB is in our view, one of the most fundamental mistakes that the Greek government has made so far and, the Greek people will suffer for their decision to reject true and direct democracy for decades to come. We believe that the solution for Greece would have been to have reformed to true democracy, exited the EU, reverted to its own currency and frozen German assets to the value of the unreturned artefacts stolen during WW2 [amounts to approx. £65 BN]. The UK offering to 'lend' Greece its Elgin Marbles is no more than an imperialist insult that 'Great' Britain feels is a kind gesture to be proud of. To summarise; Tax high earners and corporations and use this money to fund an under-lying economy [through investment in social support and employment-creation projects without cuts to public services] and then settle the government debt. The current 'solution' is to settle government debt by punishing the poor and protecting the rich, which will not create wealth and could even create further debt as more and more people become unemployed as the economy retracts even further. David "I'm on the side of hard-working people" Cameron has put more working families in poverty since records began and, if both Labour and Conservative governments have benefited via their decades-long links with Google, why did anyone ever think that Google would ever be expected to pay a decent level of tax? In their drive to sure-up voter-friendly statements and policies, UK politicians are themselves adding to the UK deficit and driving the UK bankrupt and it is this behaviour combined with corruption in the banking system that will keep the UK broke. In accordance with centralised governmental economic thinking, the current globalised capitalist system dictates that in order for businesses to survive, they must forever minimise costs and maximise profits so as to forever expand. In our opinion, these are not necessary components of a successful business or of capitalism itself and, they can actually be extremely restrictive, making businesses inflexible and therefore vulnerable [as with the banks for example]. We believe that economies, businesses, employers, employees, their communities and the natural environment would benefit far more if businesses reformed capitalism by optimising [as all in nature does] instead of maximising, by facilitating employer-participation in decision-making processes [decentralising] and, by working with [not against] the natural environment. Influenced by the will to make money only [motivated by fear that in-turn motivates greed]. Influenced by the will to make money considerately [motivated by compassion that in-turn motivates courage]. The English work 'ethic' and corporate capitalist maximisation has ensured that the UK has the longest and hardest working hours in Europe, whilst being one of the least productive countries in Europe. Within a direct democracy, a decentralised economy where businesses draw upon their local resources, use digital internal processes with digital marketing methods, focus on sustaining a profit [not on expanding profits] and are regulated by localised social justice [as opposed to centralised government regulation], will be the businesses that thrive and re-start a reformed UK economy. The answers to most, if not all questions about anything can be found in studying nature. Nature never maximises but instead always optimises. For example; plants never consume more energy or space than they need yet they survive, grow and hopefully live to fulfil their purpose. Nature makes the smartest use of what is already naturally available to it, not the biggest use. We believe that the UK economy will be best served if we base our economy upon our natural environment and copy the behavioural elements within it by translating them into business models and, by adapting the current capitalist model so that it is based upon optimising - not maximising. At the same time, our environment will automatically become prioritised along with our economy and both will thrive. Simply planting a seed and maintaining its growth through to it becoming an edible food is capitalism - and it's fair and it's sustainable if we optimise instead of maximise. The People's Administration does not believe in the establishment of a centralised global economy or a centralised world order and neither do we believe in a United States of Europe. Unlike the government, we propose that UK producers, manufacturers and service industries be allowed to be as reliant as possible upon UK suppliers, before sourcing suppliers from abroad. This could be in direct conflict with many EU directives but on the basis that this country has never been given a referendum regarding any aspect of European involvement or our obligations to Europe, the people have not democratically endorsed any obligations to Europe. Should the People's Administration install direct democracy, we propose to work with the European Parliament based ONLY upon democratic decisions, even if this potentially entails repatriating certain legal rights or pulling out of Europe politically. The People's Administration believes that any country's economic prosperity is heavily linked to the natural climate and environment of its land and, the social cohesion of its civilisation. The weaker the environment becomes and the looser social cohesion becomes, the weaker the economy becomes. This in turn leads to a more damaged and abused environment and poorer social cohesion, and a downward spiral is formed. We believe that a failure to recognise these aspects contributed to the global recession of 2008 and, we believe that linking economic aspects to environmental assets and strengthening them, will serve all countries better, making for a more vibrant global trading system that supports all countries. For example, the UK has always been a strong agricultural producer because of environmental conditions. Due to climate, global positioning and soil types, we are naturally well placed to be able to produce an extremely wide variety of food types. In the modern era, UK farmers have been forced to reduce their productivity and so their land is not used for growing food crops. This land is either left unused or is eventually sold for other purposes [such as property development] and we view this to be an abuse of this land as the land is not being used for its best potential. If UK farmers were allowed to grow food crops and hemp bio fuel crops to primarily suit UK markets, we would be spending less on imports and spending more within the UK economy. How could it ever be more efficient for the UK to import food types that can be grown within the UK? With Opium now being cultivated secretly in the UK, what's the problem with hemp? Opium is now cultivated secretly in the UK, and so what's the problem with hemp? If we reassess our natural environment for it's potential strengths and weaknesses, then we will become more self-sufficient and our economy will increase due to a reduction in imports coupled with an expansion in UK consumer spending staying within the UK economy. We recognise that doing this could compromise the EU farming subsidies paid to UK farmers but we believe that UK farmers would benefit more from their own productivity if supported by the People's Administration and by local traders.